An Author's Odyssey (Land of Stories #5) (Pre-Recorded Audio Player) | Let's Play Books! In the highly anticipated continuation of the Land of Stories series, Conner learns that the only place to fight the Masked Man's literary army is inside his own short stories. When the twins and their friends enter worlds crafted from Conner's imagination, the race begins to put an end to the Masked Man's reign of terror. Can the twins finally restore peace in the fairy tale world? 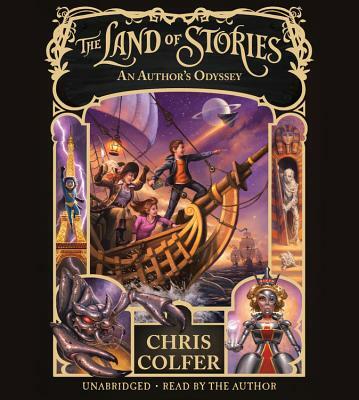 Chris Colfer is a #1 "New York Times" bestselling author and Golden Globe-winning actor. He was honored as a member of the TIME 100, "Time" magazine's annual list of the one hundred most influential people in the world, and his books include "Struck By Lightning: The Carson Phillips Journal," and the books in The Land of Stories series: " The Wishing Spell," " The Enchantress Returns," "A Grimm Warning," and "Beyond the Kingdoms."